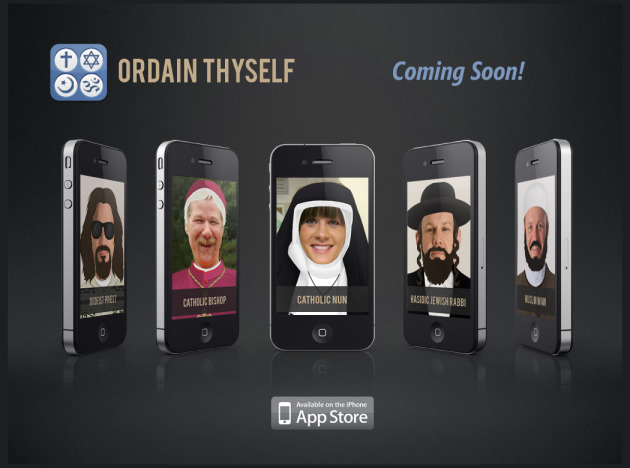 Edina pastor develops new app to "Ordain Thyself"
Ever wonder what it would be like to be a man or woman of God? Well, now’s your chance, thanks to a new iPhone app developed by Edina pastor and author Tony Jones. In addition to writing religious books and serving as theologian-in-residence at Solomon’s Porch church in Minneapolis, Jones also assists in running “social media bootcamps” for religious leaders, which helps churches become savvier at using social media to get out their messages. So how did Jones come up with the new app (which he says is meant to be entertaining and not taken too seriously)? “The idea just came to me one day about two years ago. But I had no idea how to develop an app, so I banged around a bit, looking for the right partners,” Jones said in an e-mailed statement Tuesday. “I finally found the perfect guys last fall — a developer in Des Moines (Tim Urness), a graphics guru here in Minneapolis (Gerardo Obieta), and a project manager who goes to church with me and helped me find those other two guys (Matt Glatzel). While some people have been a “bit perturbed” and turned off by the app, most have generally loved it, Jones said.